People who already know me from Fanpop might have read this article series already, but I wanted it over here at wordpress, too, so I’ll move the articles over here, with some adjustments. I’ll take a look at book-based Disney movies, I will discuss how the movie relates to the original source text (or not), what the merits and the weaknesses of the movie are, and (that’s the new part) I’ll take a look at the soundtrack. I will not do this in chronological order, but simply pick what strikes me fancy (I’m open for requests, though). Don’t expect me to do the Lion King, though. For one, the connection to Hamlet is feeble at best, it’s more a case of being inspired by it than a true adaptation, and two, technically Hamlet is a play, not a book. I also will not do the Disney Princess movies, because I plan to do them in another format. Otherwise, I guess I’ll start (again) with the classics. And what better classic to start with than Treasure Island? 1. Treasure Island is one of the most adapted books of all time. I have seen around 30 different movies and TV Shows based on it, including one movie made by Disney in the 1950s. Did we really need another one in a traditional setting? If you want to tackle this, you better find a new angle (though there already was an Italian/German production which also put the story into space called “Der Schatz im All” – one of the better adaptions, too). 2. It allowed Disney to cut down the number of characters they put on the ship – though I personally think they didn’t go far enough with this. I would have preferred even less but in exchange more fleshed out side characters. 3. Above all, it allowed for some really creative imaginary. It would have been great if they had gone even crazier than just reusing the flying whales from Fantasia 2000, but props for the final climax. The action scene is really a sight to see, especially on the big screen. A lot of people are bothered by the mix of traditional clothes with strange devices, other argue that this is simply steampunk. Neither are completely correct in my opinion. For one, it is not really steampunk. The idea behind steampunk is to imagine future technology or styles how someone from the Victorian age might have seen it (thus the use of steam instead of more modern technology). 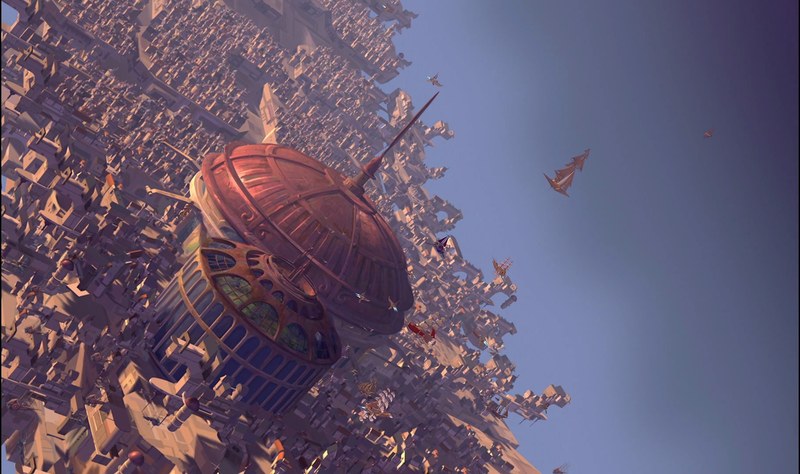 What Treasure Planet does is more the other way around, taking a very modern idea of technology, but instead of going for the more sterile style seen in other space shows and movies, like Star Trek, Star Wars, Babylon 5 and so on, it tries to insert a romantic element by seeking inspiration from the time the original book was published. In some aspects, it works brilliantly. I love the holographic books, the uniforms with a slight futuristic edge to it, the glider. In other aspects it’s confusing. Jim for example is a perfect blend between a Victorian and a more futuristic boy, his mother on the other hand misses the more modern edge in her design. I love the design of the ship (and the DVD proofs that the animators actually thought about how it works, with way more details than necessary for the movie), but if lack of air is not an issue, what’s the point of the space uniform Dr. Doppler originally wears? The design is very creative, but a little bit uneven in places. Though my solution wouldn’t have been not to do it, but to do it right, to make sure that every piece fits properly together. Thus said, I don’t think that the pieces which don’t fit are really that much of a distraction, unless you have a problem with the idea of setting it in some strange space future from the get go. 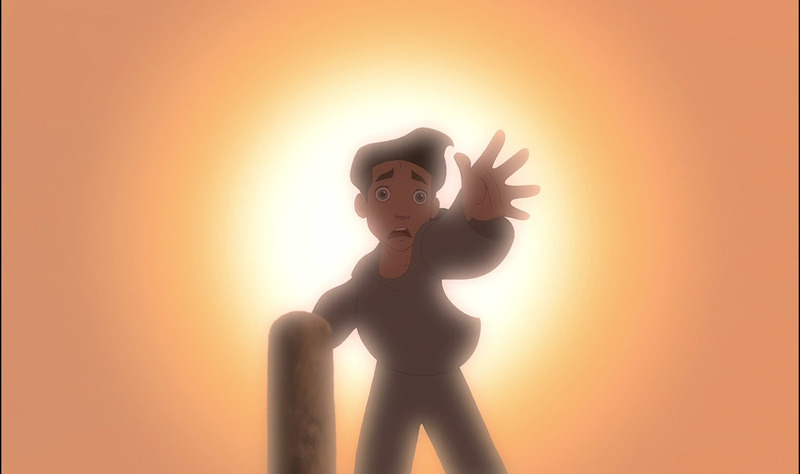 My biggest worry concerning Treasure Planet was that they would get Long John Silver wrong. The main reason I love the original book so much is this one character. Unapologetic evil, egoistical, but nevertheless so suave that you somehow want him to win, even though you know that he deserves to rot in hell. So would Disney be able to tackle this character without giving him redeeming qualities? Naturally not. Thus said, the result is not as bad as I feared it would be and at least the design of Long John Silver is really creative. But where Disney really did a good job was with everyone else. As much as I like the original book: Jim Hawkins is one of the most boring protagonists ever, more a stand-in for the reader than a character in its own right. And all the other characters are more stereotypes than layered personalities. The strict captain, the foolish squire, the gentleman doctor and the trust-worthy servants on the one side, the irresponsible, drunken pirates on the other side. Disney took those templates and turned most of them (the pirates are the exception) in layered characters. Jim is no longer the good boy, he is now the rebellious teenager. Disney is walking a very fine line with this character. It is easy to make the rebel too bratty and ungrateful to be still sympathetic. But Disney manages to portray him as someone who doesn’t really want to be bad or hurt his mother, he is just confused, unsure of himself, and unable to deal with the hurt and anger her feels because his father left him. And this is something unusual in itself: Jim’s father didn’t die, he just didn’t care enough to stick around. How often do we see something like that in a Disney movie? How often do we see a mother trying to reach out to her child and not being able to help, even though she doesn’t really do anything wrong? Tackling this issue is the biggest strength of the movie and the main reason I’m able to excuse the disneyfied version of Long John Silver. It might not be the Long John Silver I adore and expected, but it is the one which fits into the story they are trying to tell. Captain Amelia is a terrifying take on Captain Smollett. A little bit of a bragger, but competent enough to back it up, overall a really strong female character. Even with a shoulder wound she never comes off as damsel in distress. Dr. Doppler is naturally a mix of Squire Trelawney and Dr. Livesey. For a somewhat cowardly character he is surprisingly likable, mostly because he acts when he really has to, and he actually has picked up some useful knowledge along the way, but not so much that he becomes some sort of walking solution for every problem the group encounters. The pirates are still disappointingly bland, so bland, that I can’t even remember the name of the Scorpion guy who takes over the role of Israel Hands. And then there is B.E.N. To say it upfront: Never enjoyed the character of Ben Gun in ANY adaptation (nor in the book), and only a few manage to make him not annoying. Therefore it’s hard to blame Disney for this one. I like the idea of a robot without a memory chip, but they really should have toned it down a little bit. The screaming just ruins the suspense in some of the best scenes. If you read a book again and again, there comes a point at which keep skipping to your favourite parts of the story. Treasure Island basically consists of three acts: Billy Bones last days are the first one, the travel to the island is the second one and the fight on the island is the third one. I always liked the last one the best, the suppressive atmosphere of two groups trapped in an unfriendly place and the strategy involved in them outmanoeuvring each other, all this makes for a suspenseful read. Treasure Planet is a very unusual take on the story because unlike most adaptations focusses mostly on the second and not on the third act. It manages though, to make the travel much more interesting than it was in the original story. Arrow’s death is even changed in a way that it result in real consequences instead of just being a side-note. If someone asked me what the best scene of this movie is, my answer would be the “I’m still here” scene. For one, the song is beautiful and has really deep lyrics. But above all, it’s a really well done delve into Jim’s psychology. Seeing little Jim running after his father….that’s right up with some of the most heart-wrenching Disney scenes for me. As impressive as some of the action scenes are, those more quiet moments are the true strength of the movie. All in all I would have wanted more of them and more of Jim and Silver facing off, and a little bit less of the chase scenes through the ship. Speaking of “I’m still here”, I already did a very detailed analysis of the song when I discussed the “Montage Song”, and since it is the only song in the movie, there is really not much more to say about it. Concerning the score, it is a perfect fit. I especially like the triumphant undertones in it, which transport a constant feeling of excitement. 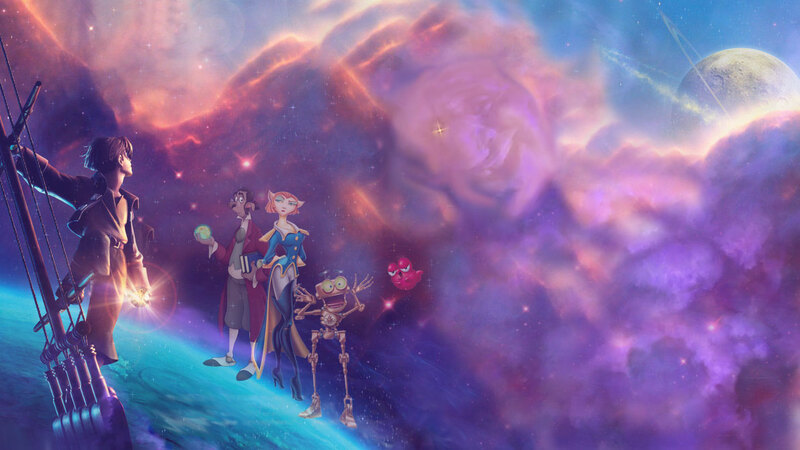 Treasure Planet is not the adaption I expected, but it is a really good and above all fresh take on an overdone story. If you allow yourself to get sucked into the world the animators created instead of second guessing everything you see, the imagination put into this is really enjoyable. It’s a little bit a movie for the big screen though, to appreciate the animation and the scale the put into the action scenes. It has its weaknesses, some clunky elements which throw the mood a little bit off-kilter, but none of them are distracting enough to ruin the movie. In the Disney canon, it’s one of the hidden gems, and definitely worth at least one watch. This entry was posted on Thursday, July 3rd, 2014 at 1:01 pm	and tagged with By the Book, Disney, Treasure Planet and posted in By the Book, Disney Era, Disney Pluralism, History of Animation, Movie Review, Multi Age. You can follow any responses to this entry through the RSS 2.0 feed. I have the book at home on my list to read next, lol.